Q. How do you determine where to put the panels? Q. Were any loans or grants used? A. The owners used ReVision’s Own Your Power financing option, a 12-year loan with a 2.99 percent interest rate. Financing is attractive because customers can pay for the system over time with the savings from their electric bill. After the loan is paid off, the system continues to make power for free for well over a decade. The owners also received a federal tax credit for 30 percent of the cost of the installation (about $15,000), bringing the net cost down to about $10,500. Q. What considerations went into the installation? A. 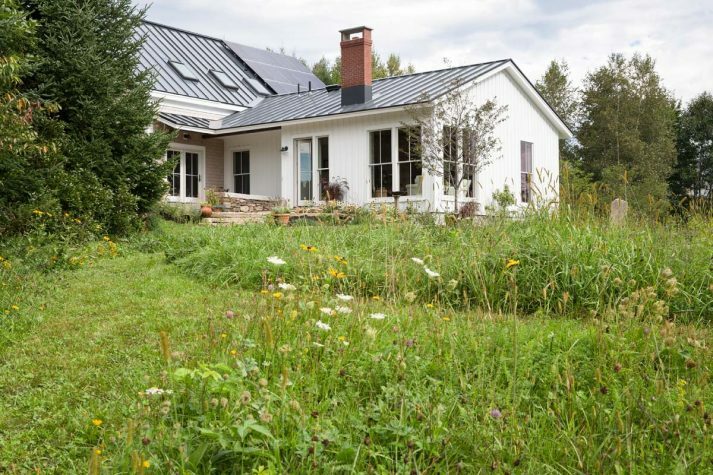 Based on the size of the house, the expected occupancy, and the fact that roughly half the house is heated and cooled with mini-split heat pumps, we estimated that a 7- to 8-kilowatt (kW) system would come close to offsetting all the electric needs for the 2,000-square- foot living space—including lights, plugs, and fans. The owners decided to pursue this goal in steps, with a 3.825 kW array initially. To preserve the option for future expansion of the system, we installed an inverter with the capacity to double the existing solar array without upgrades. Q. What are the results? A. The PV system produced 5,704 kilowatt hours (kWh) from mid-February 2015 to mid-May 2016, which is 4 percent over our prediction of 5,501 kWh for that time period. This offsets about 7,000 pounds of carbon dioxide a year. On average, the homeowners paid only an $11 flat monthly service fee from May to September; their bills from October to April ranged from $35 to $79 per month.